The importance of copywriting in UX design is well documented. The words people read on their screens, in newspapers and on products have a big impact on the overall user experience. Nobody wants to spend their time reading spelling errors, deciphering strange syntax and hunting for missing apostrophes. But copy should be paired with equally good typography for maximum readability and favorable UX design. Imagine, if you will, receiving a notification on your iPhone written in Comic Sans. Hilarious at first then undeniably incongruous. Even those not versed in typography and with little understanding of user experience would find such a notification disharmonious. Why? Because fonts have their own personalities and can invoke certain feelings and emotions. In Justinmind, using the array of default fonts and Google Fonts integration makes creating an interactive prototype with an aligned brand identity simple. Find out how to incoporporate Google fonts in your interactive wireframes here. Fonts can be serious, refined, humorous, scary and even persuasive. Understanding the power of typography in UI design means understanding how to optimize readability and usability. That’s why when it comes to creating your brand identity, keeping fonts at the front of your mind will serve you well in crafting a user experience that people enjoy (and will want to come back to!). After all, the web is made up of 80% text, according to Max Snitser, so keeping it as legible as possible can only work in your favor. So typography is useful, not just a pretty decoration. And this is handy to keep in mind when thinking about your brand identity. What makes a brand recognizable? There is a lot that goes into creating a recognizable brand. Name, logo, colors, tone, tagline and typography are just a few elements that make up a brand identity. Take Coca-Cola. There are many well-known signifiers associated with this global brand. Their famous red color, for example. The joyful Christmas commercials that play every year with the happy jingle. But for many it’s that elegant and swished Spencerian script that works so well in their logotype. Fonts are powerful and they can be used to enhance a brand and its identity. Choosing the right font is vital when it comes to crafting a successful brand identity. Can you imagine Coca-Cola with a more gothic style typeface? Not likely. Why do fonts enhance brand identity? 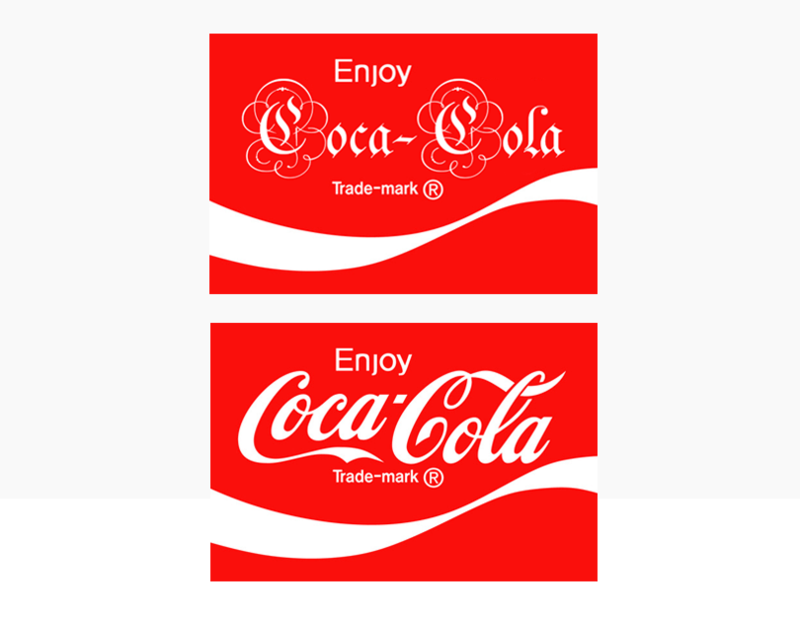 Perhaps that is why Coca-Cola’s logotype is so strong, because of its durable, visual form. Whether you agree with Robert or not, typography helps brands to communicate their message. It’s no wonder some companies pay over $100,000,000 for their logo alone. Through typographic design, brands can communicate to their audience exactly what type of brand they are. And this goes beyond just what font you choose for a logo. Our selection of UI kits and widgets come with pre-made iOS and Android elements, including the right typefaces, so your interactive wireframes will be on their way to being aligned. Typography also helps to center UCLA’s brand identity and should be used consistently across campus. To help ensure that all of our visual communications are consistent, UCLA uses a select group of preferred typefaces for digital materials and one default typeface. By detailing typography into your brand style guide, you can create consistency across your brand and avoid any mistakes from happening. Used right, your typographic design choices can demand attention and create a voice that people come to love and recognize. But which fonts should I use? There are many great fonts out in the world. There are also many terrible fonts. While font preference is personal, there are some constants within typographic design that should be applied when crafting your brand identity and typeface choices. Body font: Body fonts should be very legible and austere. Typically, although this rule isn’t set in stone, sans-serifs like Helvetica are more widely used online whereas offline in printed text serifs fonts like Times New Roman or Caslon are preferred. That’s why most of the blogs you read are in sans-serif and your books are written in serif. Display font: Displays fonts should be used sparingly but should be bold enough to capture your user’s attention. They add contrast and break up text well. Display fonts can be complex, beautiful, ornate… but be sure to use something that’s legible. No-one enjoys squinting to read something; that’s just bad UX design! Legible. This means choosing a typeface that is designed with letter forms that people are used to, which has ample spacing and easy to distinguish one letter from another. Readable. Is your text easily deciphered? Choose a font that is not only easy to read but enjoyable. Suitable. Pick a font that was designed for your intended purpose. An instruction manual written in Jokerman will get laughs for all the wrong reasons. When creating an interactive prototype of a website or mobile app, you can prototype different fonts and carry out quick user testing to get feedback. This will help you gauge which fonts work best for your audience as well as give you the opportunity to narrow down your choices until you’ve got a font that is aligned with your brand identity. A high-fidelity simulation in real-time paired with imported font libraries, which have typography guidelines as the US Web Standards, will allow you to find the most appropriate font for your UI design with very little effort or stress. As the famous architect Louis Sullivan opined: form follows function. As designers, we often want things to look pretty but when using typography to align your brand identity, it’s vital that your type serves its proper function. Without it, it’s just style over substance; meaningless instead of meaningful and that can lead to a poor user experience. Typography should enhance and not distract and when used properly and with care can turn a brand from something forgetful into something memorable.